Below are the attacks from different airlines. "There is no justification for giving Continental a competitive advantage from the preferred airport at Delta's expense – especially when Continental will reap the benefits of a major Haneda presence from its partner, ANA"
"Each of these gateways will provide significant service benefits and promote effective three-way alliance competition between Delta and the Star (United/Continental/ANA) and Oneworld (American/JAL) alliance carriers"
"While obtaining a monopoly on U.S.-flag services at Haneda would serve Delta's parochial interests, it is clearly not compatible with the public interest"
"The truth about the competitive structure in the U.S.-Japan market is that Delta is an entrenched incumbent operating more U.S.-Tokyo, U.S.-Japan and U.S.-Asia service than any other carrier"
"As such, Delta is quite content with the existing state of affairs. That is why Delta strenuously opposed an open skies agreement with Japan." "None of the four Haneda opportunities should be assigned to leisure markets such as Honolulu and Guam, which are almost entirely Japan-originating and would provide no benefit to U.S. passengers." "Delta's extraordinary bid to gain a monopoly U.S. flag position at Haneda by citing American's prospective immunity with JAL does not withstand scrutiny. Antitrust immunity between American and JAL will merely even the playing field that has long been the province of Delta/Northwest." Delta greedily applied for all four opportunities to serve two of the smallest markets at issue and two markets where Delta has virtually no connecting flights. American wants to serve two markets where American offers few connections." 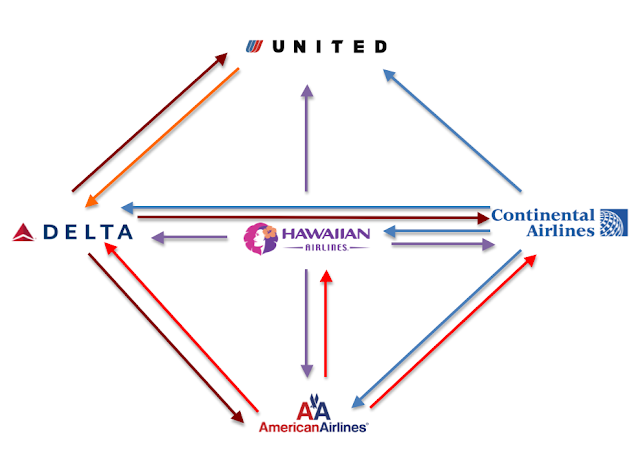 "Hawaiian never used its Tokyo Narita authority, and United's gateway would serve far fewer passengers than the top four U.S.-Tokyo markets." "DOT could pick a new entrant (Hawaiian) or reaffirm the status quo and inhibit competition by awarding all four ... to the entrenched incumbent U.S. carriers offering nothing new to the U.S.-Tokyo market." Surprisingly UA is the nice guy here. They only attack DL. Although DL and HA attacked all other applicants, they are not as bad as CO who also attacked all other applicants, including UA! How could they attack UA!? I thought you guys applied for ATI with ANA together. Isn't getting one extra slot will benefit the alliance as a whole. But CO does have a good point though. If HA thinks they can support two virtually "wingtip-to-wingtip" flights to Haneda, shouldn't they buy a larger plane instead? Applying for two slots for flights departing 10 minutes apart is fine when there are plenty of slots. But since there are only 4, giving HA both slots will be in the expense the mainland US residents!